I've always been partial to the X-Men mythology. An eclectic band of outcasts and misfits with special gifts and powers, they are united for the sake of survival. Much of the time, they are on the outskirts of their culture and society, a misunderstood group who have great intentions and prove themselves to be heroes. This story captured my misfit adolescent heart, particularly Wolverine, with his maverick attitude and adamantium claws. When the first X-Men film was released fourteen years ago, I was ecstatic, and the film holds up after all this time. The second film was even better, but many of the following films were sub-par at best (The Wolverine) and downright atrocious at worst (X-Men: The Last Stand; X-Men Origins: Wolverine). A brand new cast and retelling of the origin story in X-Men: First Class offered a glimmer of hope for the series. 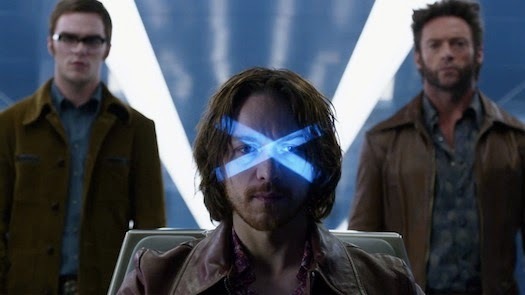 The latest installment is this year's X-Men: Days of Future Past, a thrilling time-travel ensemble film that attempts to harmonize the previous films while embarking into new territory with familiar characters. Literally, this film changes everything. In a dystopian future where mutants have been hunted nearly to extinction by robotic menaces called Sentinels, a small band of surviving X-Men--Charles Xavier, Magneto, Storm, Iceman, Kitty Pryde, and Wolverine, along with a few newcomers like Bishop and Blink--attempt a final desperate act to save their world: time travel. Through newly developed powers, Kitty can send a person's consciousness back in time to reside in their previous selves, allowing that person to know what is coming in the future and thus can choose to change the trajectory of their history. If the X-Men can send someone back to stop the origins of the Sentinel robots, they may be able to prevent the war. Wolverine is the only one who can survive such an ordeal (of course), so while the future X-Men battle incoming Sentinels and pray for a miracle, Logan is sent back into his 1973 self to convince Charles and Erik (Magneto) to join forces to prevent Raven (Mystique) from killing the creator of the Sentinels, Boliver Trask. His assassination and Raven's subsequent capture prompt a violent divide between humans and mutants, setting history on the course towards war and chaos. Sound confusing? Every time travel movie fosters its own "does that really work in time travel?" questions, with butterfly effects and history loops. Days of Future Past manages to create one of the most coherent time travel stories I've yet witnessed. The coherent time travel is perfectly complemented with extraordinary and coherent action sequences, ones that make sense both for the story and visually. I could actually see what was happening, which is an improvement over the direction of many current action films. The film is bookended with showdowns between Sentinels and mutants, though my favourite action scene was with a new character, Quicksilver, and his light-hearted teen antics in the midst of breaking into the Pentagon. The film balances these impressive action sequences with a captivating and affecting story, particularly around the tension between these various mutants. They both love and hate one another, united by their mutations while divided by their principles and paradigms. Set against the backdrop of the Vietnam war in the past and the mutant war of the future, the tensions and hatred between these enemy/friends have weight and pathos. This is a comic book film driven by its characters, not by their powers or the action scenes.The final showdown is less about the externals and more about the inner choices each character must make for themselves, a choice between violence or peace, fear or love. The X-Men story of trying to fit into a fearful society is an allegory for the gay and lesbian struggle, but I would like to humbly suggest another parallel: the church in a post-Christian society. There are two paths for this band of mutants. The way of Charles (Professor X) is one of integration and self-differentiation, being confident in who they are as a group and movement, while also living in harmony within the culture. There are many Christians attempting to take the same posture in culture, living within the society with a deep sense of mission without being reactionary or defensive. The way of Erik (Magneto) is the way of militant force, an impassioned stand-up-for-your-rights force to be reckoned with. There are also many Christians with this posture, a take-back-our-culture-for-Jesus get-em-saved-no-matter-what mentality. Both are passionate about their faith and movement--they both love mutants/the church--but have very different methods for spreading their message. We have a choice as Christians whether we will be for society or against it. I'm sure I'm reading into this, laying parallels where the filmmakers never intended, but I wonder if the connection still rings true. Days of Future Past reminds me of this: history matters. Knowing where you personally came from has significance. Understanding the origins of a movement can offer a picture of the trajectory one is taking into the future, both as individuals and as a society. We can't go back in time to change the past, but we do have a certain hope for the future found in Christ. We also have a choice about how we live today. Our choices do matter, even the seemingly small ones. Let's live in the present with the knowledge that our future is secure, no matter what grip the past has on us.